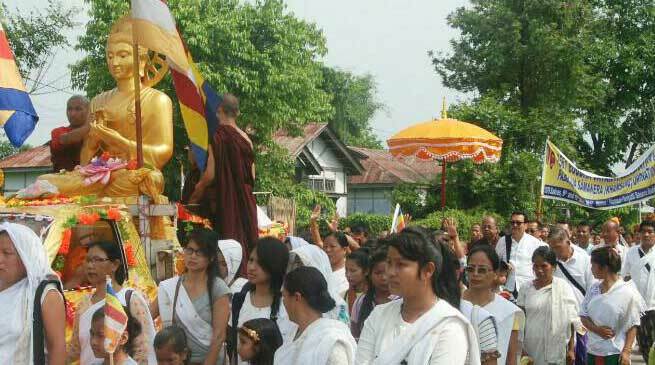 The Buddhist community on Wednesday celebrated the Buddha Jayanti, the thrice blessed day symbolizing Buddha’s birth, enlightenment and salvation (Nirvana) across state with religious fervour and gaiety. Buddha Jayanti is considered as a quite important Buddhist festival since, on this specific day, Lord Buddha was born in Shakya clan of Lumbini, attained the great Nirvana in Bodhgaya under Bodhi Tree, and attained Parinirvana in Kushinagar (Death of Buddha). At Namsai The Deputy Chief Minister Chowna Mein joined in the 2561 Buddha Jayanti Celebrations organised by the Pariyatti Sasana Buddha Vihara at Namsai. He took part in the religious procession around Namsai town along with Parliamentary Secretary Chow Zingnu Namchoom, Ven. Aggadhamma Mahathero, abot of the Pariyatti Sasana Buddha Vihara, Namsai,a host of monks and devotees. During the Dhamma Sabha Mein termed the Buddha Jayanti as a very important and auspicious day for the Buddhist community. He said that we are Buddhist by birth but still ignorant about many facets of the religion and its philosophy and called for better propagation and imparting teachings on the same. He expressed the need for preservation and promotion of Buddhist religious culture. Namsai district is an abode of Theravada Buddhism but people do not practice the principles of Buddhism and was particularly concerned about the rampant hunting of wild animals. He said hunting ought to be banned and compassion towards wildlife needs to be promoted. Mein also suggested for celebration of Buddha Jayanti on a larger scale in future and the different organisations of the community must collectively organise it. He advocated for institutionalization of the Buddhist Viharas so that it can diversify its services like in health and education sectors instead of remaining just centres of religious teachings. Chow Zingnu Namchoom while taking part in the deliberations exhorted to follow and propagate the teachings of Lord Buddha. Ven. Aggadhamma Mahathero wished and prayed for peace, success and prosperity for everyone. Earlier he had hoisted the World Buddhist Flag after the religious procession. He had also in his personal capacity consecrated a stupa in the vihara premises on the ocassion. The other programmes marking the 2561 Buddha Jayanti were ordination of ten novices (Pabbajja Samanera) and three days non stop Pathan chanting which concluded today. The celebration concluded with Khamsin Thomtra. While, the Mahabodhi Lord Buddha College Namsai organised a grand procession from its premises to culminate at Pali Vidyapith School Chongkham where students and people from all walk of life participated. Later, a blood donation camp was also organised in Pali Vidyapith School Chongkham, reported Venerable Panyaloka. The auspicious occasion was also celebrated at Golden Pagoda (Kongmu Kham) Monastery, Lathao, Empong, Phanneng in Namsai dist, Tezu in Lohit district, Changlang dist and in Tawang and West Kameng districts.